Want to be more influential with your work mates and help make team projects more successful? Come to our Good Mate Workshop on April 5, 2019. It will be held in Burlington, MA (USA), at the Scrum.org classroom and will run from 9AM to 2PM. Evan Sorensen and Jim Johnson will present an overview of over 65 years of research from The Standish Group (on project team performance) as well as the Gottman Institute (on personal relationships). 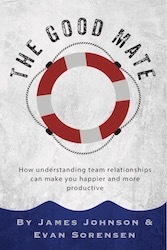 The workshop will highlight our new book The Good Mate: How Understanding Team Relationships Can Make You Happier and More Productive. This workshop is neither a team-building exercise nor a technical workshop. It is focused only on how individual team mates can develop better relationship skills for cohesive, productive, and happier teams.